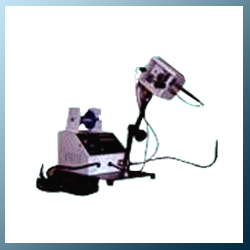 We are Manufacturer, Supplier, Exporter of Hands Free Soldering Station with Auto Solder Feeding Attachment, Hands free Soldering Station.HALLMARK TCS 450 Hands Free Soldering System is the best Robot with two pieces of arm that can be adjusted and fixed in any position at your desire by each knob, which help you hold soldering iron and feed solder wire automatically and quantitively You just take cable, wire, connector, plug, terminal, switch, pcboard etc. to touch the tip of soldering iron, then press the foot pedal, the soldering will be done conveniently and quickly. The solder feed amount, speed and the optimum soldering temperature can be freely controlled. TCS450 HFSS is the best soldering system to solve the problem of handing solder wire, the iron and components. This gives the convenience of two extra hands. The two carden arms, on attached to the solder iron and the second to the solder feeding unit can be easily set to the most suitable soldering position. Each carden arm has three joints. Arm and joint position can be adjusted With only one knob. The various functions of the HFSS can be mastered in a short time. Even the most delicate soldering job is made easy by the HFSS. The HFSS allows direct soldering without pre-soldering Use of the HFSS has been proved to boost operational efficiency. The solder wire, heater and solder iron tip are available in all standard .